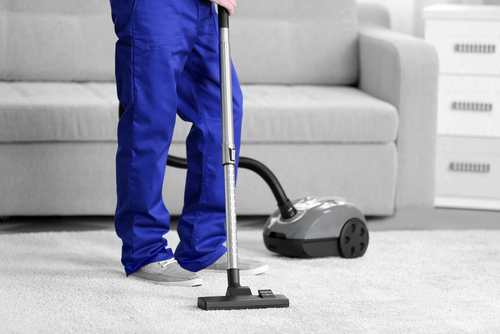 » » The Urban Guide » Homecare » Home Deep Cleaning » Refrigerator Cleaning Hacks And Ways to Keep it That Way! The primary function of a refrigerator is to ensure food does not go bad, but very often the appliance is too unhygienic to follow through on this promise. Stains left on the shelves by milk cartons, sauces and jam containers slowly develop into a breeding ground for fungi. Which is why, knowing some refrigerator cleaning hacks is extremely important. The first step to a clean fridge is emptying it. Switch off the fridge, take out all the food items stored in it. If there is food stored in freezer, place them in an icebox or a big vessel and surround with ice packs. Cover your counter top (where you will keep all the refrigerated food items) with plastic table mats or kitchen towels. This will prevent your counter tops from getting stained or wet (from condensation). Before you set off with cleaning supplies, soak the trays and baskets in hot water. Keep them soaked for 10 mins to soften grime and gravy stains. 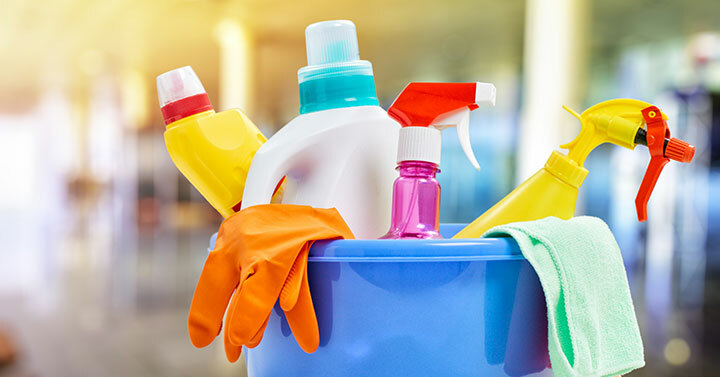 You can use cleaning fluids available in the market or make one at home using vinegar and warm water. 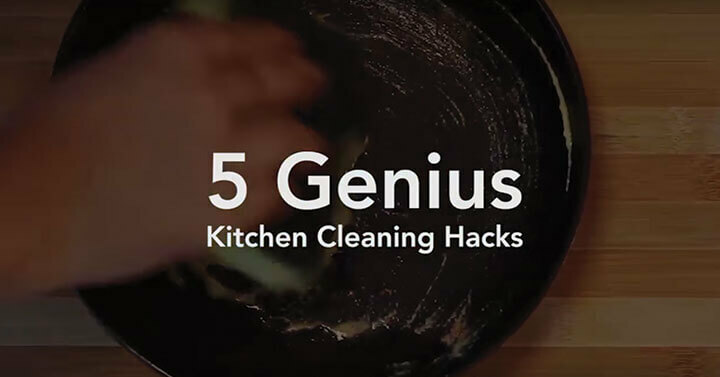 Take out the trays from the water and using a sponge, clean the stains. For tricky areas, such as the rims or edges, you can also use a tooth brush to help clean up faster. Instead of paper or kitchen towels, use micro fiber cloths. Once you have washed the trays, use these cloths to dry them up. 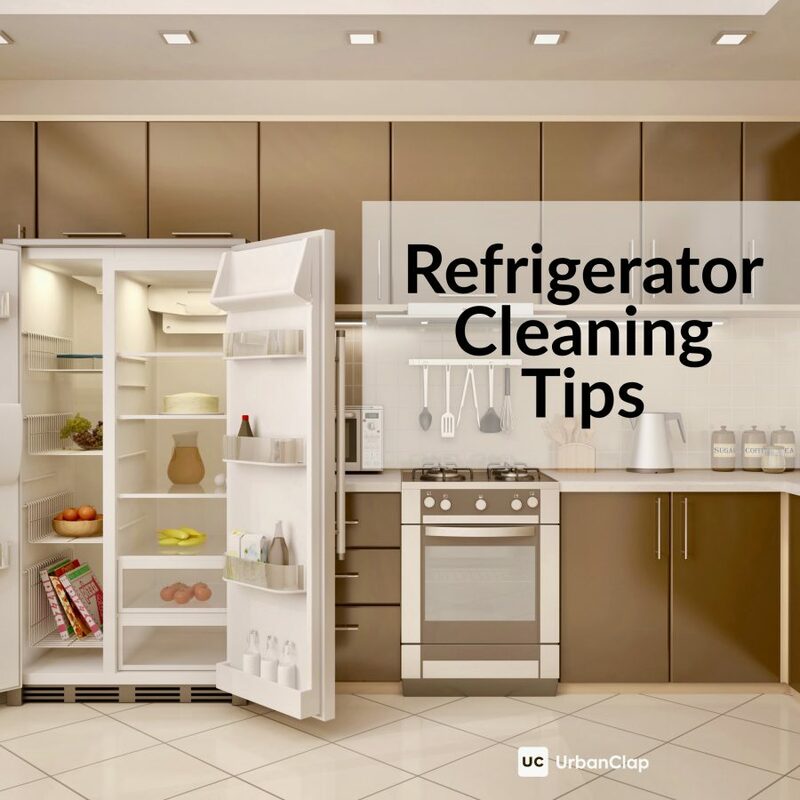 When cleaning the refrigerator, start with the area adjacent to vents, then bottle racks, butter trays and the mini vanity box. You can use the cleaning fluid used earlier, or make one at home. In the case of the latter, mix vinegar and hot water in a bowl. Dip the micro fiber cloth and clean the refrigerator. Using a dry cloth, wipe the fridge dry. For the exteriors, repeat the process. Now that the whole refrigerator is clean, it’s time put all the trays and food items back in. When you are done, leave the fridge door open for some time to dry the inside. 1. Put plastic mats or kitchen towels on top of the trays and underneath the crisper box. You can also use plastic wraps and even cling films. Remember to put kitchen towels at the bottom of the crisper. This will ensure that any juice from the vegetables or fruits will not make the bottom very dirty. Replace this paper every week for best results. 2. Wipe off the water droplets from the containers before you put them back. This prevents any mess and the bottles will not slip from your kid’s hands. 3. Move all leftovers to glass containers. This will ensure you see them and eat them instead of forgetting them inside for weeks. You can also use stickers or post-its to mark the things separately. 4. If you are a stickler for keeping similar things together, then buy some trays or bins where you can put such things together. This is especially true for the freezer as ice on the meat and fish packets make it difficult to pull them out. Keeping them in separate boxes will make it easier to take them out, especially if you have a non frost-free refrigerator. 5. Keep a container of activated carbon at the back of the bottom shelf. This will deodorize the fridge better. If you do not have activated carbon at home, then keep a bowl of baking soda or cut a lemon in half and keep it inside for 2-3 days before replacing it with another one. If you like the smell of coffee, you can also keep a few coffee beans in a small bowl to keep the fridge smelling good. 1Refrigerator Cleaning Hacks And Ways to Keep it That Way!